To save his knees, the owner of this beautifully preserved 34-year-old Centurion Semi-Pro updated to a 14-30 freewheel and 52-42-30 chainrings. 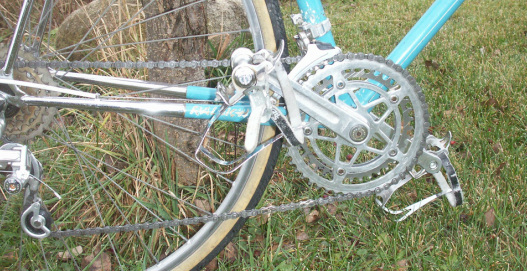 He reports that the 144 triplizer was a perfect fit for the original Sugino Super Mighty crankset. Replacing the original 112.5mm spindle with a 118mm Sugino MT-68 spindle--purchased as new old stock [NOS] on Ebay-- provided the correct chainline. Although designed for a double, the original Suntour Mk II front derailleur easily handles the triple, with adjustment to spare. A nice Tom Kellog-built Spectrum with a 52-42 and what appears to be a 30-tooth inner ring. 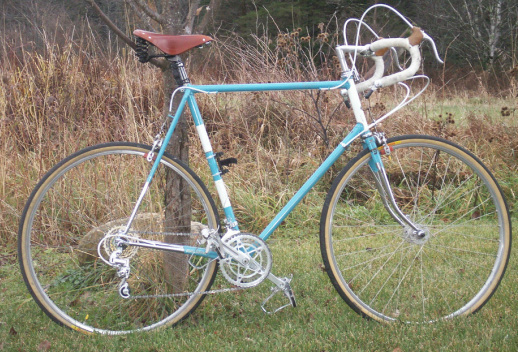 A circa 1976 Raleigh Gran Sport outfitted with what its owner (circa 1952) describes as "geezer crossover gearing"--a 46-37 double in front and a 14-17-21-26-32 freewheel. Who doesn't love that swimming-pool blue? The Peugeot PX-10 was an icon of the 1970s bike boom, but not everyone had the legs for one: Although it theoretically left the factory with a 52-42 crankset, quite a few arrived in the US with a 45- or 47-tooth second ring. Combined with the usual 14-23 freewheel, that made for tough going on hills. This newly triplized example seems to date from about 1972. Classic good looks, functionality, and compassion for suffering humanity--a 52-42-28 triple. Life is good. "What an absolute fantastic product the triplizer is. I now can ride my old PX10 wherever I want, no longer having to plan routes that avoid hills (almost impossible here in SW Washington). One of my favorite things about the triplizer is how unnoticeable it is, I use a 28 tooth inner gear and you can't even see it from the front. I'd like to thank you very much, and my knees are forever in your debt."